Cornerstone Properties has submitted a development application for a new 25 storey commercial tower located at 301 Wickham Street, Fortitude Valley. 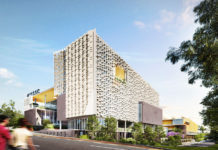 The proposed development has been designed by BVN Architects and comprises of 36,194 sqm of net lettable office space, a ground floor cafe, a gymnasium on level 1 and child care facilities on level 3. 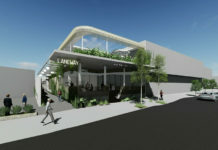 The project also includes a level 4 cafe and rooftop function room with terrace deck. The building design consists of a distinctive void that reveals a garden terrace level below. According to the landscape design report, this combination of aggregated planes and various sky-gardens throughout the tower helps create a dynamic garden setting. The current site houses a low rise two storey building which accommodates RSL care offices. 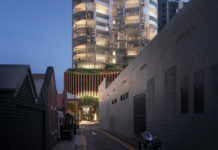 Immediately adjoining the site to the south is the Utopia Space residential development, a 25 storey mixed use tower proposed by SANDT Developments and approved on 13 August 2015. The DA number for this development is A004453881. Excellent architecture, design and location.